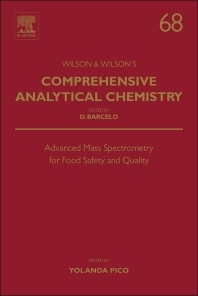 Advanced Mass Spectrometry for Food Safety and Quality provides information on recent advancements made in mass spectrometry-based techniques and their applications in food safety and quality, also covering the major challenges associated with implementing these technologies for more effective identification of unknown compounds, food profiling, or candidate biomarker discovery. Recent advances in mass spectrometry technologies have uncovered tremendous opportunities for a range of food-related applications. However, the distinctive characteristics of food, such as the wide range of the different components and their extreme complexity present enormous challenges. This text brings together the most recent data on the topic, providing an important resource towards greater food safety and quality. Covers emerging problems in food safety and quality with many specific examples. Yolanda Pico was born in Valencia, Spain, in 1964. She received her Ph.D. in Pharmacy in 1992, after which she was a post-doctoral fellow at the Vrije Universiteit of Amsterdam (The Netherlands) (1992/1993) and at the “La Sapienza” University (Rome, Italy) (1996); Assistant Professor of Nutrition and Bromatology at the University of Valencia (1993-1998). Since 1998 she is full Professor of Nutrition and Food Science at the Department of Preventive Medicine and Public Health, Food Science, Toxicology and Legal Medicine of the University of Valencia and the Head of the research group in Food and Environmental Safety (SAMA-UV). Her research interests include identification of unknown compounds by liquid chromatography-mass spectrometry, microextraction separations and environmental and food safety, development of new analytical methods to determine contaminants in food and the environment and the application of methodologies to the risk assessment of different hazard within both field. She is the author of nearly 240 peer-reviewed papers 180 scientific papers in journals of SCI, 30 book chapters and editor of 3 books on Food and Environmental Safety and Applications of liquid chromatography-mass spectrometry. She has a hirsh index of 47 has been a member of various international scientific committees of renowned institutions. Other relevant activities include the following: Member of the Scientific Panel of Plant Protection Products and their Residues (PPR Panel) of the European Food Safety Authority (EFSA) (2009-2012) and partner of projects related with food, water and soil quality at the different national and international levels. She has been supervising 9 Ph.D. theses on food analysis (1992-2014). Her main focusses are: risk assessment of the exposure to pesticide residues, veterinary and human medicines, illicit drugs, perfluorinated compounds, and other emerging compounds including toxic-analytical aspects, of bioavailability and bioaccesibility, synergisms, toxicity evaluation and detoxification.